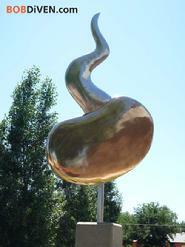 The "Bean Sprout" was a private commission for a residence in Mesilla, New Mexico. The husband is a professor in the Agriculture department at our local university and the wife is a landscape architect and New Mexico State Representative. Their property includes an historic (and massive) adobe barn. They wanted a work that was representational, related to them and their community (the work is viewable by passerbys from two nearby streets) and of a scale to stand in a garden area between the adobe barn and a curving, tree-lined driveway. My design was for a sprouting Pinto bean, crafted from silicon bronze and stainless steel -- two durable materials that would age and patina gracefully over time. I work the material from sheet form into matching halves (one set for the "sprout", another for the "bean") which were then welded together, cleaned, joined and polished. The sculpture measures 6 feet from the tip of the sprout to the lowest part of the bean, and is held above a 7-foot tall cast-concrete base by a stainless steel post. 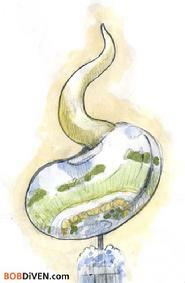 The original color sketch of the sculpture. 1/4 inch scale model of the sculpture. A close-up view from below. My next large sculptural installation will be "CELEBRATE", an heroic-scale art bus-stop sculpture for the City of Las Cruces. This large piece is due to be installed in front of the new Las Cruces City Hall in the next couple of months.